Every time I pulled open that drawer, it would remind me of my dreams and goals. There was something in that drawer that would fire up a series of thoughts. Back here in India, we have a habit of lining the wardrobes and drawers with old newspapers. The newspaper in that drawer would work me up every time I saw it. 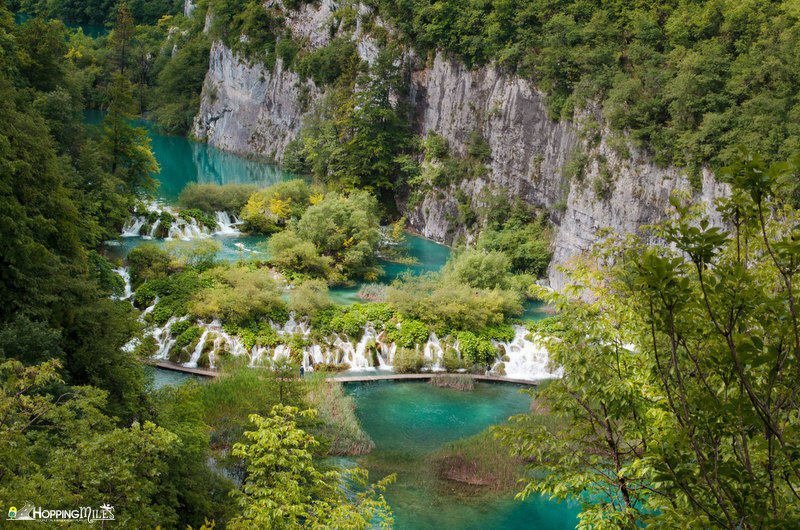 It had a picture of Plitvice Lakes National Park in Croatia with a caption ‘One of the world’s best waterfalls’. And every time I saw that picture, butterflies would fly in my stomach. Slowly, as the days passed, visiting Plitvice Lakes became my number one travel goal. And thus all the universe conspired me to visit Croatia on my first ever trip to Europe. And needless to say, the visit to Plitvice Lakes National Park was the highlight of the trip. I fell deeply and madly in love with Plitvice and I’m certain you will too. But in the absence of old newspaper in your sock drawer, I’ve put together 10 reasons to convince you. I fell deeply in love with Plitvice and am certain you will too. So Ive put together 10 reasons to convince you. You’ll be booking a flight to Croatia soon! Organize private transfers in Croatia for your day trips with Octopus Transfers. Click here. 16 cascading lakes come together to form a place so unique and gorgeous that it almost looks like heaven on Earth. These lakes are known for their cascades and the ongoing biodynamic process of Tufa, or Travertine formation, which only occurs under specific ecological and hydrological conditions. This travertine formation is prominent in Plitvice Lakes National Park and is a constant process, so is happening even as you stroll through the National Park. It makes the soil underneath very vulnerable which creates numerous waterfalls as it flows down the path. So you’re likely to meet a waterfall at every turn! Plitvice is exclusive because it nests not one waterfall but a whole range of waterfalls – of various sizes and of various heights. Again, Travertine formation is one the reason for this and the other one being Plitvice’s huge sprawl of area – a massive 72,800 acres! There are a series of small waterfalls next to the rickety wooden paths that leads you to ‘Veliki Slap’, the biggest waterfall in Plitvice. Plitvice is divided into upper lakes and lower lakes. While the lower lakes have small patches of large number of waterfalls here and there, the upper lakes consist of huge stretch of lakes that cascade down into a wonderland. 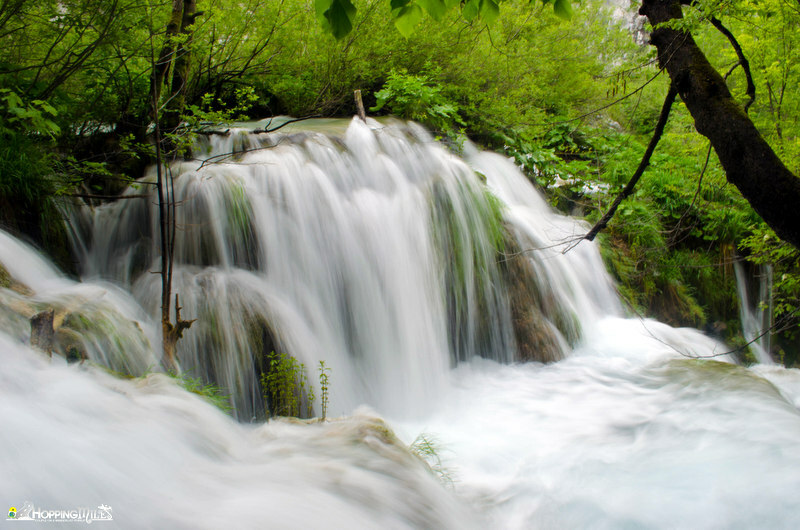 Go to Plitvice to see not one but many waterfalls. Tranquillity reigns at Plitvice. This is a place with dreamy lakes, plump forests, mesmerising waterfalls and serene environs. Crowds don’t deter the charm of Plitvice, but what is more surprising is the colour of the water here. As many shades as you can name you’ll find here; azure, turquoise, cyan, electric, turquoise and many more. 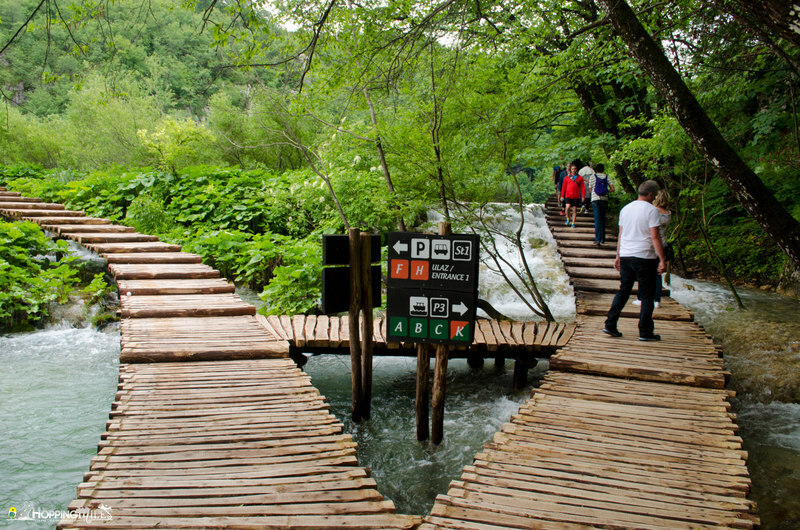 Plitvice is a hikers paradise, with 2 entrances and 8 paths to trek. Figuring out which path to take can be a bit tricky. But jump over to this page for a perfect guide to exploring Plitvice Lakes. In some parts of Plitvice, the water is so transparent and clear that the life underneath is visible to naked eye. With water as clear as crystal glass, even the scales of small fish can be seen evidently. That these fish swim in such pure water is enough to make any one jealous. Especially as swimming for human beings is prohibited here! This rule is an attempt to save the rich marine life of Plitvice which is home to many species of water creatures. If you really want to swim in a similar ambience, then do take a trip to Krka National Park, the little sister of Plitvice Lakes. In the early 1990’s, Plitvice Lakes National Park and the surrounding area was the target of the Yugoslav wars. This sad incident severely altered the ecological balance in Plitvice Lakes leading UNESCO to add Plitvice Lakes to the List of World Heritage in Danger. Later, when the war ended, Croatian government took special care to bring Plitvice back to its earlier state. 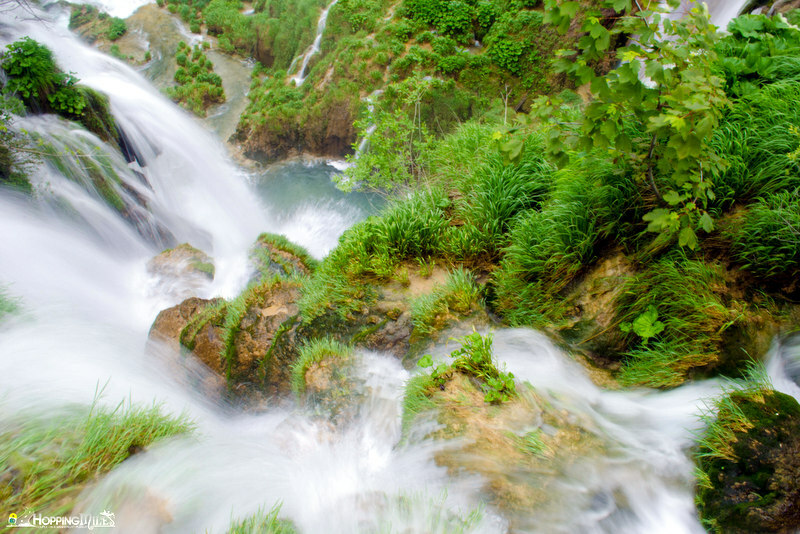 This move made Plitvice to bounce back to glory and in 1998, it was removed from the list of endangered sites. It is quite incredible to witness how nature manages to find its way amidst man’s selfish deeds! Another striking thing about Plitvice is its huge forest bank. The thick vegetation is home to various endangered and rare species of flora and fauna. Birds, reptiles, amphibians, butterflies, mammals and numerous species of plants – all live in perfect harmony in Plitvice. Some of the uncommon species of Flora and Fauna found in Plitvice include the Siberian Leopard plant, the common sundew, butterwort, bladderwort, brown bear, zooplankton, hedgehogs and dormouse – to name a few. Go to Plitvice to find rare flora and fauna nestled in the deep woods. Often appearing in the list of top 10 waterfalls to see in a lifetime, Plitvice deserves every bit of attention. Undeterred by the tourism haul, Plitvice retains its virginity amidst the crowds that flock here in every season. The ground staff do an amazing job of keeping the National Park clean and organised. A visit to Plitvice is like a hangover you can’t get rid off. Go to Plitvice to have an experience that lasts for a lifetime and beyond! If anything can give offer stiff competition to the beauty of Plitvice, it’s the drive there. It was drizzling when we drove to Plitvice that made the experience even better. Large stretches of tiny flowers with yellow and purple colors were heavily sprinkled across the fields that never seem to end. The roads that snake in between the thick woods with electric green leaves together with the splatter of raindrops hitting the windows made a heavenly drive to Plitvice. Go to Plitvice to drive one of the beautiful stretch of roads in the world. Plitvice is ever beautiful, though changes its looks for every season. If the Autumn colors of the foliage in Plitvice entice the eyes, the cheerful green vegetation of the Spring invites for a treat. While Autumn and Spring boast off their beauty in glory, Winter doesn’t hold back and shows off its frozen lakes and waterfalls while trees are covered with fresh snowfall. Go to Plitvice to come back again! 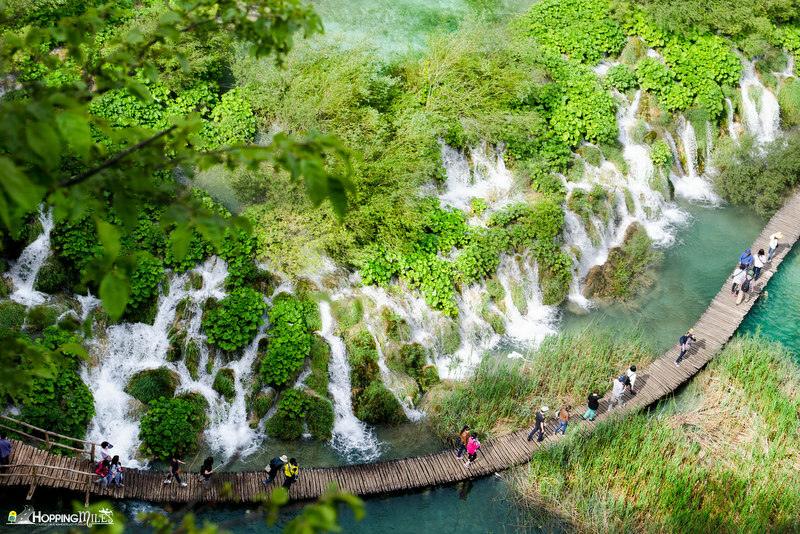 Now that you are impressed with Plitvice Lakes National Park, get to work and book your next flight to Croatia! European Beaches for Adventure Seekers: Have You the Guts to Go? 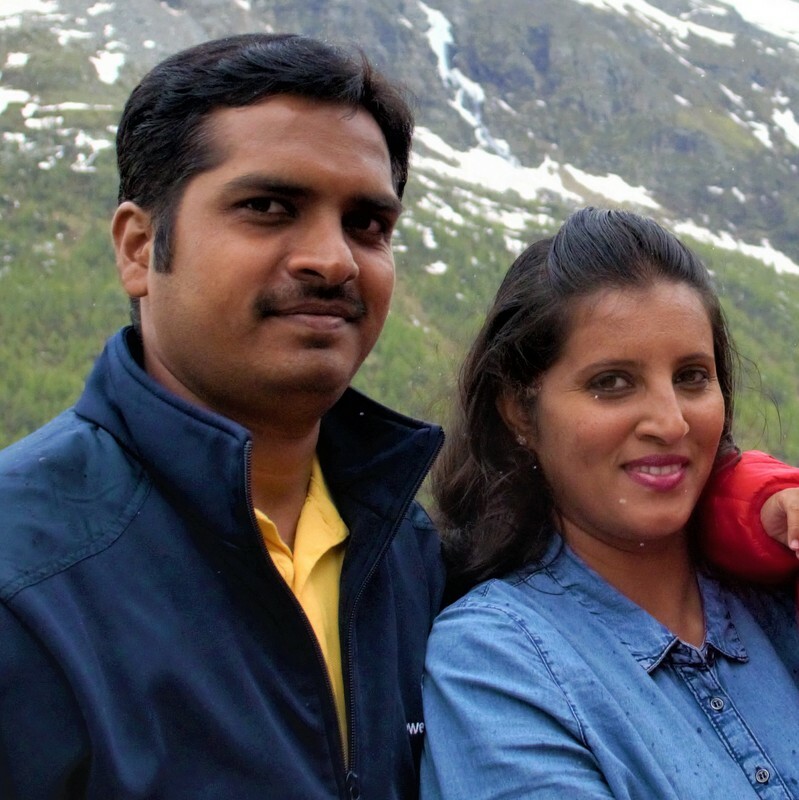 Ashwini and Neetan are a wanderlust bitten couple who love to crunch miles through their road trips. For them, traveling is not just about seeing a place like a tourist, it is about feeling and experiencing it like a traveler. Experiences are what they vouch for and swear by. On Hopping Miles, they share their itineraries, experiences, know-hows, what to and what not to do, those little secrets and everything else that can save you a fortune! They hop to places unseen and you too are bound to hop with them. Follow them on Facebook, Twitter and Instagram too. Cool! Man, those waterfalls look incredible and with what sounds like a beautiful drive getting there doesn’t sound too bad either. Now… getting to Croatia from Montana is a different story. Definitely! The whole experience from start to finish sounds amazing, even before you arrive! With every guest post I publish my bucketlist seems to grow longer too :D! I’ve never been to Croatia – OK, I’m lying, I was there, but only by car, on the highway, on the route to another country. I have so many places I want to visit there, and Plitvice Lakes is on the top of my list. It is simply spectacular! The views are stunning! Love your reference to the alchemist, it’s one of my favorite books.I hope to visit Croatia soon. Wow! I’ve never heard of Plitvice and now, I know I must go! While I know I must make my way to Europe soon, I don’t know when I’ll get to Croatia. Maybe sooner than I think! So glad that we could collaborate with Ashwini to introduce you! Croatia should definitely be on the Europe list :) Happy travels! Glad we could collaborate with Ashwini to inspire you Pily! Croatia is a beautiful country, I know you’ll have a great time! I’m so impressed that you made your dream trip after being inspired by a newspaper; I may have to try you draw-lining technique. I’ve been wanting to visit Croatia and now I have another reason to go. The waterfalls at Plitvice Lakes look absolutely stunning and I love the winding boardwalks. Great pics too! The draw lining is a pretty great technique right! No better way to inspire a trip than to stare at a photo of paradise each day! Plitvice National Park has long been on my wishlist too. The color of the water is just mesmerizing. My husband traveled to Croatia for work and I was able to join him for a few days. Plitvice Lakes was the highlight of the trip. We couldn’t believe how beautiful it was. It was almost more than we could take in. Highly recommend. Your photos are so beautifully captured. I really love this kind of scenery with water and mountain at the backdrop! So glad you enjoyed the post Chloe :) Ashwini has a wonderful way with both photos and words!! Wow, my jaw literally dropped when I saw your photos! I am now putting this on my list to visit. It is totally amazing view, indeed it is a oaradise! Thank you for sharing! These photos are beautiful! Makes me want to go there! I hope I get invited to speak there! Aren’t they! Ashwini took some incredible shots! I love Plitvice Lakes! But your photos definitely look a lot better than mine. I really want to return during the autumn/winter and see the whole thing in the different colors. Lovely blog. How lucky you are to have visited this beautiful place. All from a newspaper article! Life is a thread, and we never know who pulls it or from which direction. I have never seen lake like this.This one is amazing, can’t express my feelings . Very thanks for sharing this. So lad we could introduce you John :) I hope you have the opportunity to visit Croatia soon! I’ve visited Croatia 9 times – and Plitvice 5 times. I still hope to visit at least one time more in my life. It’s simply beautiful, and I call it “Heaven on Earth”! I would love to visit Croatia one day and see Plitvice Falls. They look so beautiful. Thank you for sharing the info and the great pictures. Happy travels. 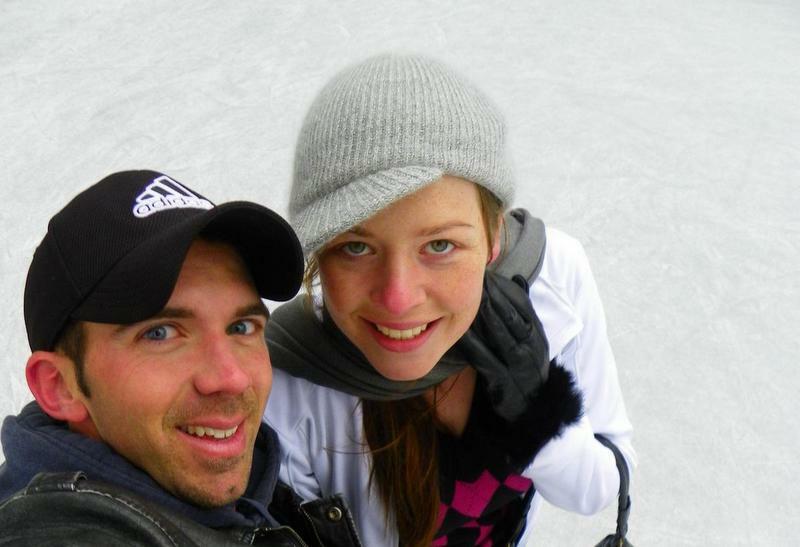 So glad you enjoyed the post Samantha :) Hope you have the opportunity to visit at some stage soon!